Scotland's west coast is an undisputed world-class sea kayaking destination. 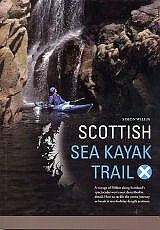 This book challenges the reader to kayak a 500km route, from the Isle of Gigha off the Kintyre peninsular, to the Summer Isles near Ullapool. It can be undertaken in four holiday-sized sections or as one long, glorious journey. The history of this country is inextricably linked to the west coast, from the Scoti to the Norsemen, the Lords of the Isles to the Clearances. An historical thread, woven through the text, tells 'Scotland's Story'.